by Terry Bookman, William Kahn. Rowman & Littlefield, 2007. What happens when you combine the wisdom of a rabbi with the expertise of an organizational development consultant? You get an insightful book called This House We Build. Authors Bookman and Kahn, both Rabbis, psychologists and co-founders of the Eitzah Center for Congregational Leadership, describe in this book the power of positive relationships and show how to avoid some of the common traps that can lead to serious conflict. The book is divided into sections devoted to "Healthy Houses," Healthy Congregants," Healthy Clergy," and "Healthy Relationships." It also includes numerous case studies from synagogues related to challenges such as “struggles over what to do with an endowment fund,” “changing a worship service time,” and “clergy transitions.” Each case study examines the challenges of congregations and their leaders to create healthy institutions as the authors integrate organizational theory with faith values. For non-Jewish congregations, the book offers rich insights into Hebrew texts and culture and the common elements between synagogue and church life. 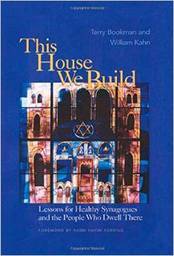 Rabbis, pastors, and lay leaders seeking healthier congregations will find much wisdom here.